The Survival Tabs are a convenient, compact, lightweight, and life-sustaining 60-day food ration for any emergency. These ultra high-calorie food tablets provide full vitamin and mineral requirements, protein for strength, carbohydrates, dextrose and lactose for fast energy in desperate circumstances, essential fatty acids for long-lasting endurance when you need it most. and they taste great, too! Average consumption of twelve tabs per day may be decreased when other foods are available in adequate amounts and quality, or increases in times of complete starvation or extreme physical exertion. It assures you a full 100% USRDA of 15 essential vitamins and minerals. This is a true Survival Food that will keep you alive and moving for months on the amount you can carry in your own pack. When traveling abroad, where food safety and nutrition are a concern, The Survival Tabs can safeguard against possible gastrointestinal distress and other issues caused by eating local foods you may not be accustomed to. Always know that The Survival Tabs will give you optimal nutrition for sustainability and peace of mind where ever your destination may be. The Survival Tabs are ideal for busy moms who need a boost of energy, without the crash caused by energy drinks. Students use them to keep their energy up and brains alert during study sessions and hectic class schedules. Presently, The Survival Tabs are being purchased by pilots, yachtsmen, outdoorsmen, firemen, and military personnel as a quick and convenient source of nutrition. They are also popular with cyclists, gamers, marathon runners, scout masters, survivalists, long-distance truckers and office workers alike, who often miss a meal and need a sustainable energy snack. Camping Food 1-Day Camping Food Supply 12 Tabs Camping Food contain 15 Essential Vitamins & Minerals. Made with the highest quality protein which is essential in survival situations where your body needs to assimilate as much as possible from what you eat. With most the food we eat 30%-60% of the calorie content leaves the body unused. The Survival Tabs have highly concentrated formula that 99% of their calorie content is absorbed by the body with 97% of the protein content being available to repair or replacement of muscles, nerves, etc. We have samples of The Survival Tabs that were produced in 1974-75. They have been stored at room temperature. We test them periodically and have found little, if any, deterioration or loss of vitamin or food value. Our results showed negligible loss in these areas. Freezing temperatures will have no effect at all on these tablets. We would estimate the shelf-life is 25 years, but suggest rotating them to ensure maximum food value every 2-3 years. NUTRITION: Twelve 3.9 grams of The Survival Tabs contains: Fat 25%, Protein 9%, Carbohydrates 58%, Iron 18 mg. (as Ferrous Fumarate), other minerals, 2% (from milk solids), and the following vitamins in percentages shown of their USRDA adult allowance. There are approximately 20 calories in a 3.9 gram The Survival Tab: Vitamin A - 5,000 I.U - 100% ; Vitamin D - 400 I.U - 100% ; Vitamin E - 30 E.I.U - 100% ; Thiamine (B1) - 1.5 mg - 100% ; Riboflavin - 1.7 mg. - 100% ; Niacin - 20.0 mg - 100% ; Pyridoxine (B6) - 2.0 mg - 100% ; Folic Acid - 0.4 mg - 100% ; Vitamin B12 - 3.0 mg - 100% ; Vitamin C - 60.0 - mg - 100% -Package Includes: 1 x 12-tab pouch. Camping Cooking Bag Portable Lightweight No Fire Needed Food Outdoor Survival! Portable Camping Cooking Bag. Heat Up Canned Food Quickly and Easily. No Fire, No Electricity. Just Add Water! Hangover Relief Party Patch effectively and safely replenishes the vital levels of vitamins, nutrients and antioxidants your body loses when you consume alcohol. Hangover Relief Party Patch may reduce the physical side effects of alcohol consumption. Hangover Relief Party Patch is the Ultimate Natural Hangover Defense that will help wipe your hangover woes away. Hangover Relief Party Patch is a 100% natural hospital-grade transdermal patch that when worn while consuming alcohol may dramatically reduce the effects of a hangover. Hangover Relief Party Patch specially-formulated ingredients and transdermal delivery system effectively replenishes the vital Thiamine and essential vitamins lost when you consume alcohol.3-Day Survival 36 Tabs Vanilla contain 15 Essential Vitamins & Minerals. Made with the highest quality protein which is essential in survival situations where your body needs to assimilate as much as possible from what you eat. With most the food we eat 30%-60% of the calorie content leaves the body unused. 3-Day Survival 36 Tabs Vanilla have highly concentrated formula that 99% of their calorie content is absorbed by the body with 97% of the protein content being available to repair or replacement of muscles, nerves, etc. We have samples of the Survival Tabs that were produced in 1974-75. They have been stored at room temperature. We test them periodically and have found little, if any, deterioration or loss of vitamin or food value. Our results showed negligible loss in these areas. Freezing temperatures will have no effect at all on these tablets. We would estimate the shelf-life is 25 years, but suggest rotating them to ensure maximum food value every 2-3 years. Package Includes:- 3 x 12-tab pouch- 1 x Party Patch. Ensure the safety of yourself and another during a natural disaster with the help of this Emergency Survival Backpack with Emergency Food Ration MREs Meals Ready-to-eat (180 Tabs/Butterscotch)! This backpack has everything you need to make it through the storm. Included 2 gallon water bag and 3600 calorie food ration bottle will keep you nourished. Use the light stick and emergency whistle to get the attention of rescuers. 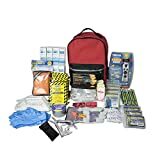 This kit also includes 2 thermal blankets, an LED flashlight with batteries and a 48 page natural disaster guide to walk you through the situation. Be prepared when an emergency hits. The Survival Tabs contain 100% of the U.S. RDA of 15 Essential Vitamins & Minerals. Made with the highest quality protein which is essential in survival situations where your body needs to assimilate as much as possible from what you eat. With most the food we eat 30%-60% of the calorie content leaves the body unused. The Survival Tabs have such a highly concentrated formula that 99% of their calorie content is absorbed by the body with 97% of the protein content being available to repair or replacement of muscles, nerves, etc. Backpack Includes:1 x 2.5 Gallon Water Bag2 x Thermal Rescue Blankets1 x LED Flashlight with Batteries1 x Light Stick1 x Whistle1 x Roll Toilet Paper2 x Rain Ponchos1 x 48pg Natural Disaster Guide1 x 48pg Homeland Security Guide6 x Survival Water Pouches - USCG Approved1 x First Aid Quick Card2 x N95 OSHA Approved Respirator Mask9 x 4-tabs Survival Tabs Emergency Food Supply. The Survival Tabs are a convenient, compact, lightweight, and life-sustaining 3-day food ration for any emergency. These ultra high-calorie food tablets provide full vitamin and mineral requirements, protein for strength, carbohydrates, dextrose and lactose for fast energy in desperate circumstances, essential fatty acids for long-lasting endurance when you need it most. and they taste great, too! Average consumption of twelve tabs per day may be decreased when other foods are available in adequate amounts and quality, or increases in times of complete starvation or extreme physical exertion. It assures you a full 100% USRDA of 15 essential vitamins and minerals. This is a true Survival Food that will keep you alive and moving for months on the amount you can carry in your own pack. When traveling abroad, where food safety and nutrition are a concern, The Survival Tabs can safeguard against possible gastrointestinal distress and other issues caused by eating local foods you may not be accustomed to. Always know that The Survival Tabs will give you optimal nutrition for sustainability and peace of mind where ever your destination may be. The Survival Tabs are ideal for busy moms who need a boost of energy, without the crash caused by energy drinks. Students use them to keep their energy up and brains alert during study sessions and hectic class schedules. Presently, The Survival Tabs are being purchased by pilots, yachtsmen, outdoorsmen, firemen, and military personnel as a quick and convenient source of nutrition. They are also popular with cyclists, gamers, marathon runners, scout masters, survivalists, long-distance truckers and office workers alike, who often miss a meal and need a sustainable energy snack. The Survival Tabs are a convenient, compact, lightweight, and life-sustaining 15-day food ration for any emergency. These ultra high-calorie food tablets provide full vitamin and mineral requirements, protein for strength, carbohydrates, dextrose and lactose for fast energy in desperate circumstances, essential fatty acids for long-lasting endurance when you need it most. and they taste great, too! Average consumption of twelve tabs per day may be decreased when other foods are available in adequate amounts and quality, or increases in times of complete starvation or extreme physical exertion. It assures you a full 100% USRDA of 15 essential vitamins and minerals. This is a true Survival Food that will keep you alive and moving for months on the amount you can carry in your own pack. When traveling abroad, where food safety and nutrition are a concern, The Survival Tabs can safeguard against possible gastrointestinal distress and other issues caused by eating local foods you may not be accustomed to. Always know that The Survival Tabs will give you optimal nutrition for sustainability and peace of mind where ever your destination may be. The Survival Tabs are ideal for busy moms who need a boost of energy, without the crash caused by energy drinks. Students use them to keep their energy up and brains alert during study sessions and hectic class schedules. Presently, The Survival Tabs are being purchased by pilots, yachtsmen, outdoorsmen, firemen, and military personnel as a quick and convenient source of nutrition. They are also popular with cyclists, gamers, marathon runners, scout masters, survivalists, long-distance truckers and office workers alike, who often miss a meal and need a sustainable energy snack. NO SOURCE IS LEFT UNTAPPED IN THIS ALL-ENCOMPASSING GUIDE TO SUPPLYING LIFE-SAVING WATER AFTER A DISASTERYou can survive up to three weeks without food, but only three days without water! When catastrophe strikes, having enough water can spell the difference between life and death. The Prepper’s Water Survival Guide offers a step-by-step plan with straightforward information you can easily follow. Thanks to this book’s laser-focus on water, you’ll quickly learn how to: •Store fresh water•Collect rainwater•Purify water from lakes & rivers•Dig a well for groundwaterIn addition to harvesting water, you’ll gain the tools to keep large stores untainted for long periods of time, test the water you collect for dangerous toxins, and treat water-related illnesses that are commonly contracted during a disaster. Hangover Relief Party Patch effectively and safely replenishes the vital levels of vitamins, nutrients and antioxidants your body loses when you consume alcohol. Hangover Relief Party Patch may reduce the physical side effects of alcohol consumption. Hangover Relief Party Patch is the Ultimate Natural Hangover Defense that will help wipe your hangover woes away. Hangover Relief Party Patch is a 100% natural hospital-grade transdermal patch that when worn while consuming alcohol may dramatically reduce the effects of a hangover. 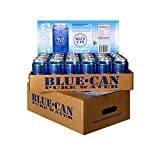 Hangover Relief Party Patch specially-formulated ingredients and transdermal delivery system effectively replenishes the vital Thiamine and essential vitamins lost when you consume alcohol.2-Day Survival 24 Tabs Chocolate contain 15 Essential Vitamins & Minerals. Made with the highest quality protein which is essential in survival situations where your body needs to assimilate as much as possible from what you eat. With most the food we eat 30%-60% of the calorie content leaves the body unused. 2-Day Survival 24 Tabs Chocolate have highly concentrated formula that 99% of their calorie content is absorbed by the body with 97% of the protein content being available to repair or replacement of muscles, nerves, etc. We have samples of the Survival Tabs that were produced in 1974-75. They have been stored at room temperature. We test them periodically and have found little, if any, deterioration or loss of vitamin or food value. Our results showed negligible loss in these areas. Freezing temperatures will have no effect at all on these tablets. We would estimate the shelf-life is 25 years, but suggest rotating them to ensure maximum food value every 2-3 years. Package Includes:- 1 x 24-tab pouch- 1 x Party Patch. The Survival Tabs are a convenient, compact, lightweight, and life-sustaining 1-day food ration for any emergency. These ultra high-calorie food tablets provide full vitamin and mineral requirements, protein for strength, carbohydrates, dextrose and lactose for fast energy in desperate circumstances, essential fatty acids for long-lasting endurance when you need it most. and they taste great, too! Average consumption of twelve tabs per day may be decreased when other foods are available in adequate amounts and quality, or increases in times of complete starvation or extreme physical exertion. It assures you a full 100% USRDA of 15 essential vitamins and minerals. This is a true Survival Food that will keep you alive and moving for months on the amount you can carry in your own pack. When traveling abroad, where food safety and nutrition are a concern, The Survival Tabs can safeguard against possible gastrointestinal distress and other issues caused by eating local foods you may not be accustomed to. Always know that The Survival Tabs will give you optimal nutrition for sustainability and peace of mind where ever your destination may be. The Survival Tabs are ideal for busy moms who need a boost of energy, without the crash caused by energy drinks. Students use them to keep their energy up and brains alert during study sessions and hectic class schedules. Presently, The Survival Tabs are being purchased by pilots, yachtsmen, outdoorsmen, firemen, and military personnel as a quick and convenient source of nutrition. They are also popular with cyclists, gamers, marathon runners, scout masters, survivalists, long-distance truckers and office workers alike, who often miss a meal and need a sustainable energy snack.